The island of Brač is the largest Middle Dalmatian island. Its is approximately 40 km long, and12 km wide and its surface area amounts to 395 km², which makes it the third biggest island in the Adriatic Sea. It is located 6 to 13 km away from the shore. To the south, it is separated from Split by a Brač canal, and to the west from the island of Šolta by Split gate, while to the South, Hvar canal separates it from the island of Hvar. Its coast is extremely well-indented and full of magnificent natural beaches. The highest peak of the island is Vidova gora with the altitude of 778m, which is at the same time the highest peak of the whole Adriatic. The island is one of the sunniest areas in the Adriatic, with all features of the pleasant Mediterranean climate. The average temperature during the summer is around 25°C and during the winter 9°C and it has 2600 sunny hours per year. It has warm and dry summers and short and mild winters. Mirca are characterized by typical rustic atmosphere of a small Mediterranean town. The inhabitants traditionally plant fruit, olives and vineyards. The beautiful sandy beaches surrounded by pine offer a true Mediterranean atmosphere, away from the hustle and bustle of modern life. Peaceful settlement and preserved nature, and the closeness of Supetar, the main port of the island, makes Mirca interesting destination for family holidays and guests who want to experience the authentic atmosphere of island life. 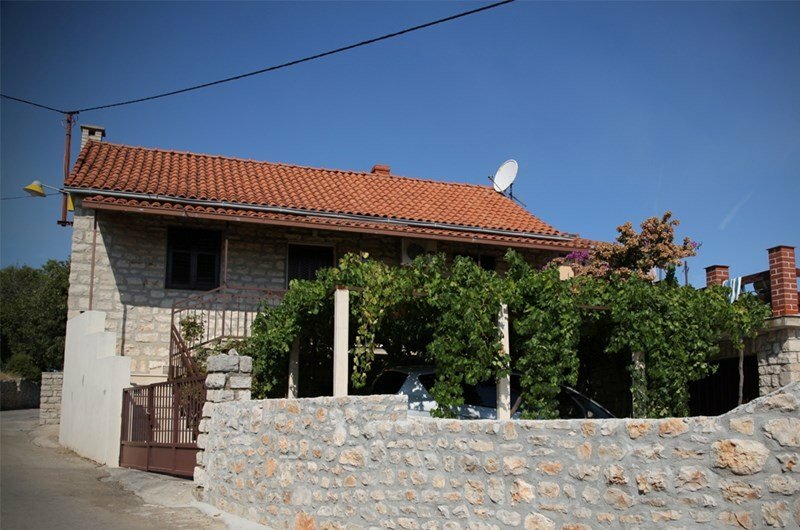 The stone house stands in the village Gornja Mirca on a hill with a beautiful view of the sea with soothing silence and without traffic this place will provide the perfect oasis for spending your holidays.